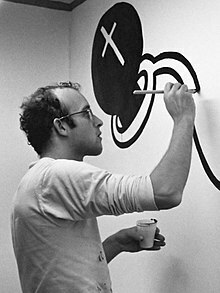 American artist Keith Haring was best known for his pop, graffiti inspired art which touched on his experiences as a gay man with AIDS living through the AIDS epidemic. His art was very much in the public eye after his passing in 1990, as many artists, such as Madonna and Red Hot Organization, dedicated proceeds from their work to AIDS charities in his memory. Keith is one of many people who is memorialized on the AIDS Memorial Quilt. In 1989, Keith founded the Keith Haring Foundation to provide funds and imagery to AIDS and children’s programs. In 2017, his sister Kay wrote and published the book Keith Haring: The Boy Who Just Kept Drawing. Kay wrote the book with children in mind as Keith was very passionate about creating a better future for children, and inspiring them to do good for the world. Another book, Keith Haring: The Authorized Biography, was written in 1992 by John Gruen. Filmmaker Christina Clausen released a documentary film about Keith in 2008 called The Universe of Keith Haring, which played at many different film festivals during that year and was released the following year on DVD. This entry was posted in Artist Focus, Blogs, LGBT, Pride. Bookmark the permalink.